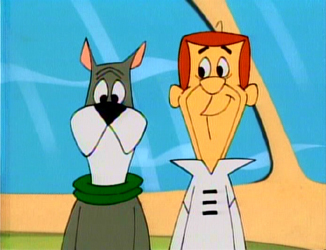 Laura Ingraham misses the Jetsons. I don't care. In her 2003 conservative book/rant, “Shut Up and Sing!” radio talk show host Laura Ingraham condemned know-nothing entertainers (among others) who use their popularity to push political views on their audiences and others. I certainly agree with her primary point, which is the expertise and notoriety in the entertainment field does not confer any special perceptiveness in matters of government and social policy, and many, if not most, of the opinions being vocally expressed by these singers, actors and comics are ignorant at best and infantile at worst. Thus it is puzzling that Ingraham has increasingly been using her radio show, which is supposed to be about politics and current events, to hold forth on the relative value of children’s movies and TV fare in 2011 compared to the films and television programming of the past. To say that she doesn’t know what she’s talking about is being kind. She also is displaying such wretched aesthetic taste and factually mistaken analysis that her comments amount to pundit malpractice. Last time I commented on Ingraham’s laments for bygone trash, occasioned by her nostalgia for the brain-rotting TV creations of Sherwood Schwartz (“The Brady Bunch” and “Gilligan’s Island”), I assumed that this was just a one-time lapse. No. Ingraham, who is a new mom, is now apparently watching children’s fare for the first time in a long while, and has begun making her critical pronouncements a regular feature of the show. Laura argues that Pixar films are “too fast paced” and lack “the beauty and emotional power” of hand-drawn animated films like “Cinderella.” The older films have their own charm and artistic values, and if she likes them better, that’s up to her. Still, virtually no serious critics argue that such films as “Up,” “Finding Nemo,” “Toy Story” (1,2 or 3), and “Wall-E” are not every bit as aesthetically and emotionally satisfying as the best of the Disney classics. Then Laura goes on at length about how inferior such cartoons as “Sponge Bob” are to her favorite Hanna-Barbara yuck-fests, like “Josie and the Pussycats.” If these were just fleeting opinions from an unsophisticated viewer with no taste or experience, they would be harmless. But Ingraham uses her credibility as a social critic to go on and on extolling “Scooby Doo” and “The Jetsons,” as if they are noble casualties in the culture wars. There is more wit and humor in one episode of “Sponge Bob” than in the full run of “The Jetsons.” Nostalgia is not the same a quality. There is plenty of garbage among the cartoons and other TV programming for kids—there always has been. Still, the general quality and variety in children’s entertainment today is far superior, in both writing and artwork, to what was available in the Sixties, Seventies and Eighties. The great exceptions are the Warner Brothers cartoons, which 1) date from the Forties and Fifties, 2) were designed for adults, and 3) are more violent and sexually suggestive than anything Laura rails against today. If Laura Ingraham is going to chastise entertainment professionals for a pulling a bait-and-switch on their audiences to argue politics, she should follow her own advice. I listen to her, when I tune in, to hear what the best and wittiest far-right female pundit is saying about the state of the world, not to be bombarded by her weird biases in children’s entertainment. I think the underlying issue is the far right associates culture with politics. I don’t think she sees any difference. That’s strange, if true. When did bad taste in entertainment become political? Not bad taste, per se, but culture in general. You haven’t noticed the far right using the moral degradation of culture as a political tool? It’s like what the left did horribly with political correctness…but the other way around (cultural beliefs to drive politics and reinforce historical positions (with no regard to whether or not they were good), instead of political ideas trying to change culture). I know they’re all the same company, but Scooby Doo is a couple levels above the Jetsons and Josie and the Pussycats. The former holds up pretty well as subversive comedy, though it’s not as complex as Sponge Bob. Specific example: the Don Adams episode, where Don Adams plays himself…but for some reason working as an exterminator. I’ve noticed this too, but would add that nostalgia for the “good old days” seems to be a core tenet of culture wars conservatism. The core message of the “culture wars” is that they want to take us back to an earlier time before “liberals” (in the sense of anyone not part of the Religious Right) infected politics, entertainment, and everything else with their godless agenda of tolerance and socialism. I for one wish this was the case, as a godless agenda of tolerance and socialism sounds damn good to me. Huckleberry Hound, Quickdraw McGraw and the old 7 PM prime time cartoon series were also by H-B and were 20X cleverer than Scooby, but they were also written for adults—like the Flintstones. On the other hand, new art and entertainment forms, like video games, rap, hip-hop, 3-D movies, music videos, TV reality shows, action movies, genre movies, and genre TV shows have evolved and are objective upgrades.That doesn’t mean that some people get left behind, or just don’t like newer forms–or just can’t take the time to appreciate them. Good rap is amazing, and the accusation that its all crap is ignorant; but as with jazz, I just don’t enjoy it very much. I would never be foolish enough to try to make the argument that hip-hop was per se inferior to the McGwire Sisters singing “Sincerely” or Perry Como. Yet that’s what Ingraham is doing, Worse, because if there is any art form that has become infinitely better and more sophisticated than animation, I don’t know what it would be. “The Simpsons,” tired as it is, still is funnier and cleverer every week, by miles, than “The Flintstones” in the best episode of its run. “The Family Guy” is gross, but it is to post-modern humor what Chuck Jones was to vaudeville. Pixar’s scripts are the best-written stories in movies period, and they look amazing—if you prefer Bambi or Peter Pan, fine, but arguing that the latter are objectively in a higher class is unsupportable. As someone who works pretty hard in the arts, I know real expertise when I see it. because everyone is an audience for entertainment doesn’t make everyone qualified to claim to understand it. That was kind of an unstated point in the critic Commandments—assuming you have expertise, which critics should have, use it fairly and usefully. Critics without expertise whouldn’t be critics. You make some good points. Good rap IS amazing and poetic, (when I can make out the words :p) but like a lot of art forms the majority gets dumbed down to make money. On the topic of video games which I know a bit better, it’s pretty easy to call a game like Grand Theft Auto IV or S.T.A.L.K.E.R. art, but the latest Call of Duty potboiler is a very large stretch. And I think people’s nostalgia goggles just tend to make them forget the potboilers etc. as time goes on and remember only the classics. Again on video games, nobody remembers the legions of terrible, terrible games back in the 80’s and 90’s when production values were low enough that any Joe could publish one. They just remember the true classics and then they get nostalgic for that time. Could it be some folks are afraid of change period? Some would say that’s the definition of conservatism. I agree though,she should stick to politics. See my comment above. For some reason (well, several reasons), conservatives are, on balance, less sophisticated and artistically oriented generally. I don’t think conservatism makes you have less taste; I think it does tend to make one less willing to explore new approaches . Everyone has a bias toward the familiar, not just conservatives. Conservatives are correct that new does not mean better…but in some art forms, it undeniably has meant better. What hacked me off was that Ingraham was grousing about one art form, kids entertainment, that has generally improved. I think that agrees with my point. The actual quality doesn’t matter, just what it can be tied to.